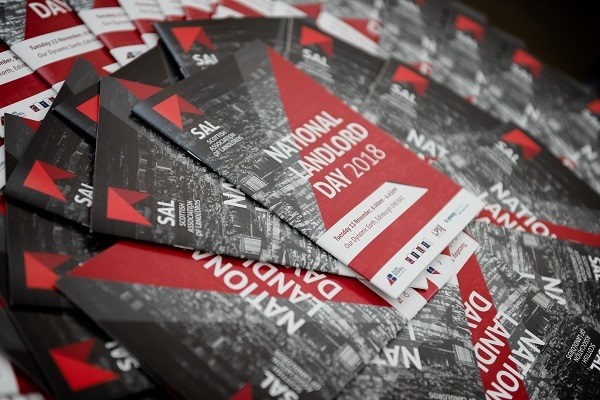 Each year as November looms, the long dark nights set in and the winter seems long, but there is always a ray of sunshine on my horizon in the shape of National Landlord Day (NLD), a date in my calendar that I never miss and look forward to each year, writes Dundee based SAL landlord member and event helper Maria Di Ponio. Like minded professional landlords from all over Scotland travel to the fabulous Our Dynamic Earth in Edinburgh to meet and talk and learn about all things ‘landlordy’. 2018 saw the eleventh NLD and again it was the largest landlord conference in the UK, a must-attend event of the year. On a quick perusal of the programme I could see the event was taking on a whole new format this year, so an interesting and varied day lay ahead for all the delegates. The diverse programme allowed the delegates to hear from a wider variety of speakers and enabled us to tailor our day to meet our own interests. Speakers were lined up to address issues of enforcement of current regulations, how to sustain and develop our lettings businesses and opportunities to learn about and find solutions to help make letting easier. It was great to see that SAL continued their annual tradition to donate a charity space at the conference and this year they invited MND Scotland who were keen to talk to delegates about overcoming housing issues faced by sufferers of this incurable illness. Doing things a bit differently this year with breakout sessions gave delegates the opportunity to choose which presentations to attend. The main biosphere area held sessions throughout the speaker programme schedule but for the core period from 11am to 3.30pm there were breakout sessions running too. The Ozone area was dedicated to presentations from the exhibitors and the Showdome and Salisbury Suite hosted speakers on various specialist topics. John Blackwood chief executive of SAL set the scene for the day reiterating that Scottish landlords welcomed political support for stronger enforcement in the quest to ensure a healthy and professional private rented sector in Scotland. He went on to introduce the guest chair for the day, Stephen Jardine from BBC Scotland, who then welcomed delegates to the 11th National Landlord Day, where topics to be covered would include First-tier Tribunal decisions, tax and finance, short term lets and handling difficult situations. All delegates remained in the main Biosphere area to listen to Paul Macaulay from Turcan Connell deliver his ‘Protecting your rental income in the face of changing taxation’ session. Paul gave delegates an overview of LBTT, CGT & income tax requirements, outlining how landlords can mitigate the impact of the new restrictions on deduction of finance interest from income tax with alternative ownership structures. The Biosphere welcomed Graham Simpson MSP who chatted to Stephen Jardine about his alternative vision of the private rented sector. The Ozone saw the first of the exhibitors step up in the shape of David Hackett from The Letting Protection Service Scotland who discussed dispute resolution and supporting a claim. Deposit disputes can often be a landlord’s deposit nightmare, so David outlined how to avoid them and how to present a better case that’s more likely to result in the landlord being paid what they are owed in a tenant deposit dispute. The Showdome session under way at this time focussed on understanding Universal Credit (UC) with Sandra Robinson and Susan Johnston from the Department for Work and Pensions giving delegates a general overview of UC in the hope of demystifying it and to help landlords to manage better when using it. The rollout of UC continues with it being offered by all job centres by the end of 2018 and managed migration of existing claimants starting thereafter so a timely session to prepare landlords as more and more tenants migrate over. The Salisbury Suite session was dedicated to a firm favourite speaker at the conference in the shape of Elspeth Boyle from Landlord Accreditation Scotland, who discussed investing in training by outlining what’s on offer for individuals and companies alike, reiterating how an affordable investment in training could have huge returns in business benefits. Biosphere with Fiona Campbell from ASSC and Adam McVey from the City of Edinburgh Council who chatted with Stephen Jardine about short term letting and what all the fuss is about. Fiona firmly believes better enforcement of existing holiday let regulations is the answer, but Adam outlined concerns from the council and residents about the rapid rise of short-term rental offerings on the market. Adam discussed possible changes looming to include owners requiring to apply for a change of use for the residence as well as a potential tourist tax being levied on these properties. Ozone with Steve Cox from Alan Boswell Group, a sponsor of the conference, talking about landlord insurance and pointing out that sometimes you don’t know if yours is good or bad until you need to claim. Steve explained the top 10 things to look out for when choosing your insurance provider. Showdome with Shaheena Din from The Scottish Empty Homes Partnership Scotland who discussed how empty homes are a waste of valuable resources and how an empty home could be a profitable addition to your portfolio while also delivering a new rental home to the market. She provided details about the information and support available to investigate this opportunity further. Salisbury Suite with Thomas Ashdown from Citylets who discussed quality (mid tenancy) data by presenting their blockchain technology used in their ‘SSORTed’ application, as quality rental data becomes ever more important to a sector under pressure from all sides. After a busy and informative morning, delegates were treated to a lovely break to enjoy lunch, refreshments and an opportunity to mill around and chat to the exhibitors. Biosphere with Carolyn Hirst from Hirstworks who talked about handling difficult situations and outlined her suggested approach to handling complaints. Her key pieces of advice were to adhere to your complaints process, to listen, to understand, to empathise, to keep calm and to try to negotiate a resolution. Ozone with Fraser Sutherland from SME Professional who chatted about reducing costs in implementing the letting agent code in this high cost year for agent members. Scottish technology companies want to help their clients and Fraser showed how the right use of technology can offer savings for companies. Showdome and Salisbury had repeat sessions from the morning to allow delegates who missed them in the morning timetable to hear them now. Biosphere with Ronnie Murison from Stirling Park LLP who talked about enforcing tribunal decisions and the role of the sheriff officer in eviction and payment orders and more. The room was packed to hear from Ronnie who offered some comfort in the knowledge that they manage to successfully trace people in about 75% of cases suggesting it might be money well spent to allow you to pursue tenants for rent arrears or the cost of remedying damages. Ozone with Stephen McAlaney from Home Energy Scotland for the last of the exhibitor sessions talked about how to understand your EPC and improve its rating. He explained what the numbers on your EPC mean and how to make these better. With minimum energy ratings coming soon for Scottish rentals now’s the time to get the knowledge and see what can be done cost effectively to prepare. Again, Showdome and Salisbury sessions were repeats allowing delegates to get all the info they wanted from all the sessions on offer throughout the day. A welcome afternoon tea break was then on the agenda before all delegates reconvened in the main Biosphere hall to listen to the final sessions of the day. Delegates were treated to a panel session to discuss what’s new in finance with David Morrison from EQ Accountants, Duncan MacInnes from Ruffer and Hugh Meechan from The Mortgage Lender. On a positive note delegates heard that more choice in BTL lending means landlords can benefit from using a broker to find the best deal but this was tempered by the fact that the panel suggested that property isn’t an easy investment and the panel think that capital growth may be lower in the future. The impact of section 24 income tax changes was discussed including how it will ramp up for many over the next 3 years with only about 11% of landlords looking for advice benefitting from changing to an incorporation model. The last session of the day came from the ever-popular TC Young LetLaw, regular speakers at the conference and long-time sponsors of the event. Jim Bauld talked about recent tribunal decisions and what can we learn from them. He also updated delegates on the new tribunal jurisdictions and outlined the process for applying to the tribunal. All that was then left to do was for John Blackwood to bring another fantastic NLD to a close. He gave huge thanks to the speakers, exhibitors, delegates, event staff and most importantly the sponsors Citylets, TC Young LetLaw, AB Group and LPS Scotland. He also thanked Stephen Jardine for being an excellent guest chair. Another NLD under my belt, a jam-packed day from start to finish with lots of nuggets of useful information as always, roll on November 2019.